UPDATE: This. And please read all the way to the bottom, including the comments. Controversial fossil fuel company iGas, currently packing up its exploratory well at Barton Moss, has been given the go-ahead to look for shale gas in the heart of Manchester City Centre, it can be revealed. A secret agreement, signed by Richard Leese, Leader of Manchester City Council and Kate Chappell, Executive Member for the Environment, has been seen by MCFly. 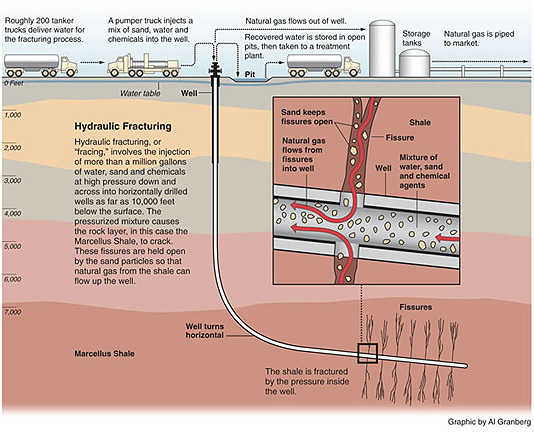 Following a meeting at an undisclosed location (1), the new agreement allows iGas to do everything it likes, up to and including pumping whatever chemicals it thinks it needs to in order to bring low-carbon shale gas up from deep below the city streets. Contacted by phone, Professor Kevin Anderson of the Tyndall Centre, mild critic of shale gas exploration, declined to give a comment, but could be heard sobbing and – in keeping with the previous ten or so years of his life – banging his head against a wall. Drilling is due to start precisely a year from today, on 1st April 2015. 1. Conflicting reports give it either as the City Arms or a hollowed-out Pacific volcano. 2. For climate action, Manchester needs more ‘tories. It really does. This entry was posted in Democratic deficit, education, Manchester City Council. Bookmark the permalink. An easier, and cheaper, supply of gas would be obtained by connecting a pipe directly to the Town Hall council chamber; there is plenty of gas emanating from there (though it may not burn very brightly!). You had me going there for a minute – until the phrase ‘back of a fag packet’. It’s all too plausible – and I guess that was really the point. Sadly, almost within the range of the possible- even on April 1st!